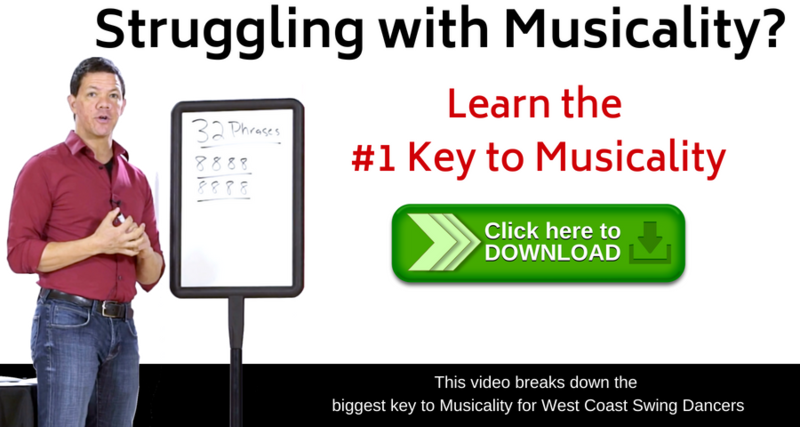 One of the most difficult elements in west coast swing is the triple rhythm. Most dancers struggle with the body control necessary to do three weight transfers in two beats of music because the body has to syncopate. As a newer dancer we must first master the basic timing of the triple step. More advanced dances need to understand the concepts much deeper. Let get started with that now, but first…. What is a triple step? Triple steps are three complete weight changes in two beats of music. If you simply march to the beat of a WCS song, you will take two weight changes in two beats of music: For a triple step, we need to fit a full additional weight change in the exact same amount of time, which means that we need to take quicker steps. You will step on the first beat, take a second step on the & count that is halfway between the first and second beats, and the third step on that second beat. To practice dancing triple steps, start with a slower WCS song. 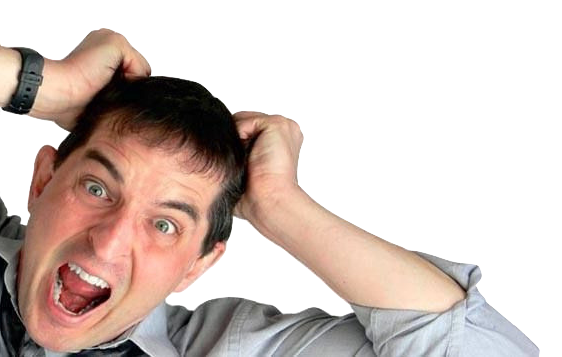 (90–95 beats per minute) Work on becoming comfortable with taking three full weight changes in each two-beat period (i.e., left right left or right left right). If you have a hard time finding the & beat, try clapping the triple step rhythm rather than stepping it first. As you get proficient at stepping out triples to slower songs, practice doing triples to songs that have higher tempos. Eventually, you want to be able to comfortably triple step to song at 120–130 bpm. Once dancers learn to put a weight transfer in between the downbeat and upbeat, they next need to think about where the & count belongs. While most of us learn to dance with the & squarely between the downbeat and upbeat, we eventually are introduced to the rolling count: &a1&a2&a3&a4. Now we will explore a question introduced by the rolling count: why do we put the middle step of the triple on the ‘a’ count (which is closer to the upbeat), instead of the & count (which is closer to the downbeat)? History gives us the answer. Historically, our dance comes from swing and blues rhythms, and one of the most important rhythms is the shuffle rhythm. 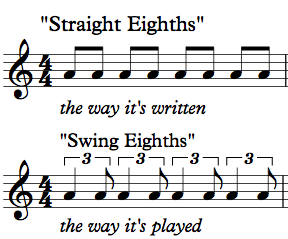 In a shuffle rhythm, the beat is divided into triplets* (just like our rolling count), and the drummer plays the beat and the last triplet, but leaves out the triplet that comes immediately after the beat. 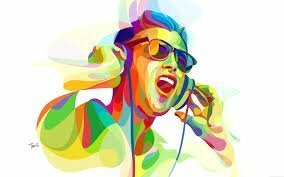 A triple rhythm has three notes in two beats of music. That’s different from a triplet, which is dividing a single beat into three parts. Our triple rhythms occur over two beats of music and hence two triplets. Our rolling count gives names to each part of the triplet: the number, the &, and the a. 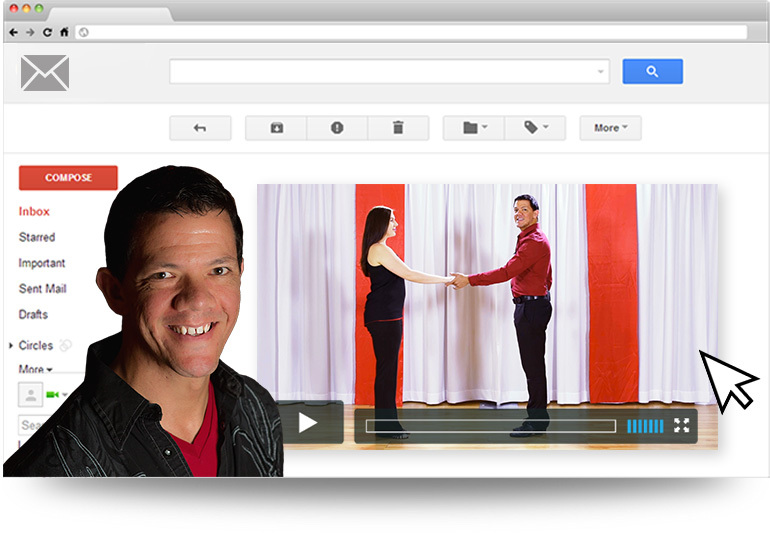 If you’ve ever wanted to know what makes swing music swing… You’ll love the video below! The video will explain the idea from the prospective of the drummer. It is guaranteed to help you understand the concept in a way that is difficult in an article like this. Now can you hear the triples in the music? Now that you’ve heard shuffle rhythms explained from the point of view of the drummer, listen for it in the music. In the following song, I’m the Only One by Melissa Etheridge, you can clearly hear the shuffle rhythm and feel the triplets. Incidentally, the shuffle rhythms in this song are a major reason why this song is so great for introducing rolling count to dancers—the song practically begs for you to dance a rolling triple. So that’s the historical answer. We dance on the ‘a’ count of the rolling triple because our dance comes from swing and blues rhythms such as the shuffle rhythm. This style of dance using the rolling count, is very common among the top west coast swing dancers over the decades. Want to leave the triple step out? 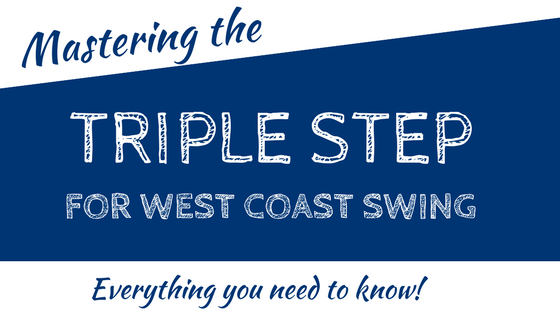 We believe that mastering the triple step is one of the first major keys to great west coast swing. Lets admit it though… Once you know the rules.. you can begin to break them. Take the next step and learn to leave the triple step out. We walk you through it in this blog post!